Just a few weeks ago, I told you how members of the Hospital Disaster Support Communications System of Orange County, California were able to provide vital backup communications following the Hector Mine earthquake, because they didn't wait for activation by any government or private agency. What I didn't say then was that this marked the 68th time that HDSCS provided emergency communications for the 34 hospitals of the county over the past 19 years. The last activation had been only a month earlier, when a gas main ruptured near a 500-bed hospital in the City of Orange, requiring evacuation of a medical building and activation of the hospital's disaster plan. This same ARES® group of almost 90 members activated itself for earthquakes in Whittier and Northridge, for the Laguna firestorm, and for floods in Anaheim and Laguna. But 67 major disasters haven't occurred that time, of course. Over three quarters of HDSCS activations have followed failures of phone systems within a single facility. For example, Activation Number 69 came just two weeks after the Hector Mine quake. As maintenance technicians were working on the phone system at a 192-bed hospital in Orange on October 30, all the phones failed, and HDSCS responded immediately. N3IVO: "OK, just an update. Paul has checked in from ONC, that's the tactical call we're using for OICU (Oncology Intensive Care Unit) and ONC (Oncology). So he's on location, he's working. Two more additional check-ins, UFS has come in, he's going to the Emergency Department and he's going to check in when he gets to that location. Ralph has come in and he's going to NICU (Neo-natal Intensive Care Unit), so we'll hear from him when he gets situated. N3IVO." WA6OPS: "OK very good, and I'm assuming TSM is awaiting BWH's arrival and then you'll make assignments for those two." When phones go out in a large hospital, they call it an "internal disaster," because the normal flow of communications between critical units such as ICU, ER, Pharmacy, and Surgery is disrupted. Five to ten HDSCS members go into all those critical spots to pass this vital traffic. Fortunately, this most recent outage lasted only a short time, but HDSCS has handled other internal and external phone failures that have gone on for almost 24 hours. These failures are rarely reported in the press. If you live in a major metropolitan area, the chances are that hospital phone outages are occurring near you every year, with no media coverage at all. Amateur Radio could be providing vital help, but it can't happen unless hams in your town are prepared with training, plus a rapid and robust alerting system. From southern California, this is Joe Moell KØOV, for Amateur Radio Newsline. The Central Point for Orange County's HEAR/ReddiNet (inter-hospital voice/data system) is at Loma Ridge, the county's Emergency Operations Center (EOC). HDSCS hams are an important backup to this system in the county's emergency plans. 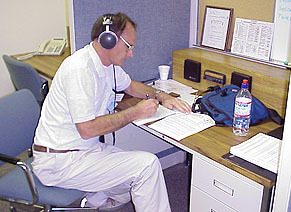 In this photo, Louie DeArman K6SM is the HDSCS operator at a position in the EOC Amateur Radio Room during a multi-hospital drill.